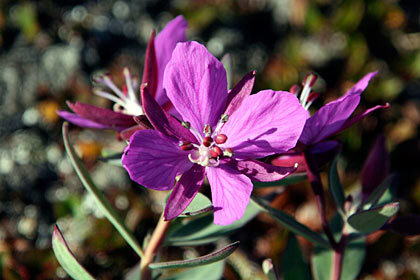 "Niviarsiaq" , the national flower of Greenland. 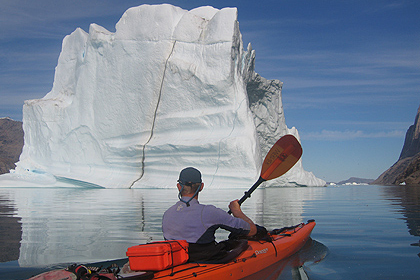 Paddling next to an iceberg , Scoresby Sund fjordsystem . 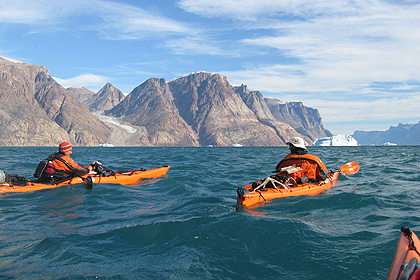 Paddling next to Røde Ø (Red Island) , Milne Land , Scoresby Sund fjordsystem. 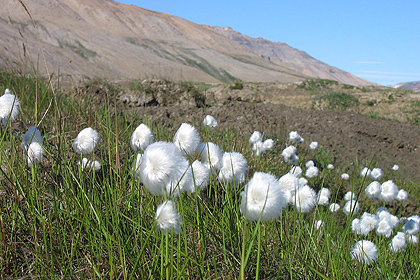 Arctic fauna in beautiful surroundings , Jamesonland . 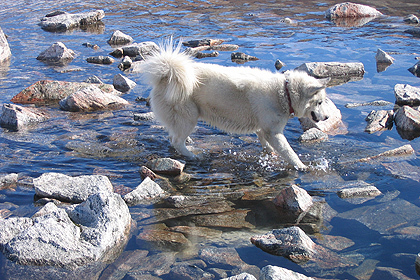 Greenland sleddog crossing the river in Jamesonland . 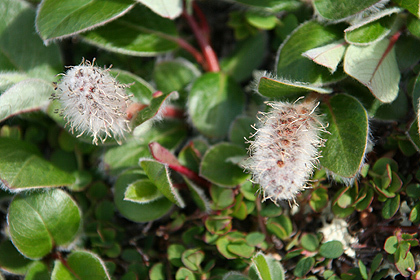 Arctic fauna - actually , it is a small tree. 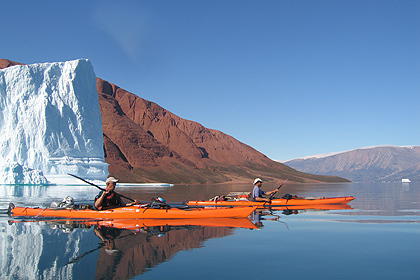 An arctic Laguna : The Walrus bay , Ittoqqortoormiit . 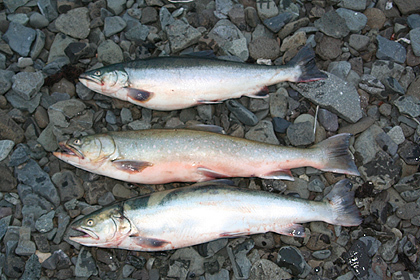 Perfect for ice fishing in the spring , picnic or barbecue in summer , hiking and camping . 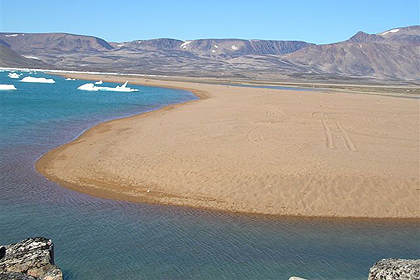 Some children even swim here in summer ! 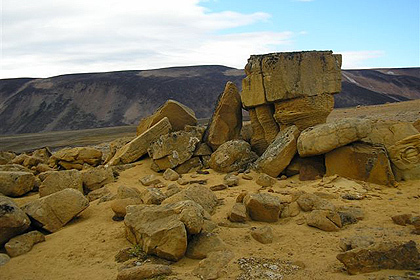 Crossing over Walrus Bay , you'll reach Gule Fjeld (Yellow Mountain) , which is covered in concretions and funny stone formations. 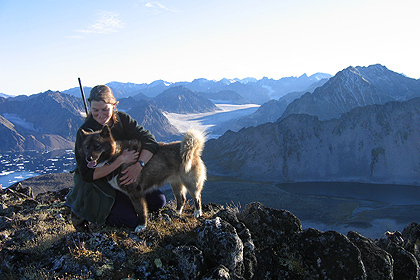 Yellow Mountain can be reached in a few hours . 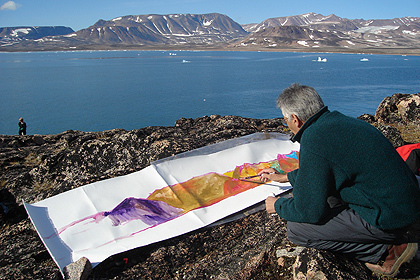 Artist Charles Bezzina is creating a masterpiece for the local administration , in the Walrus Bay . 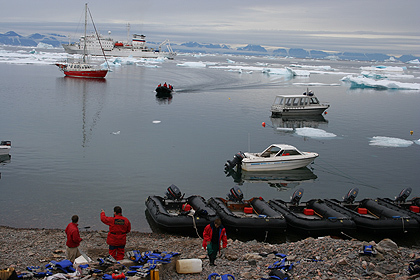 Cruise visit in Ittoqqortoormiit . Nanu Travel arranges open town packets for the yearly 20 cruise visits. 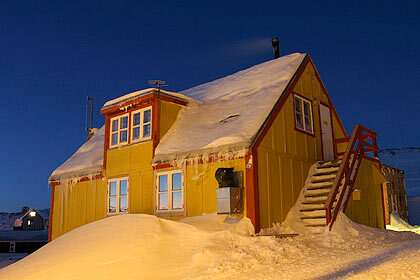 In summer we have sun 24 hrs a day in the Ittoqqortoormiit area . This photo was shot in the middle of the night. Ann & Hansigne at Kap Hoegh , Liverpoolland at the outercoast. 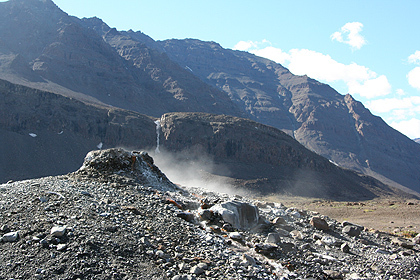 Hot spring at Turner island . 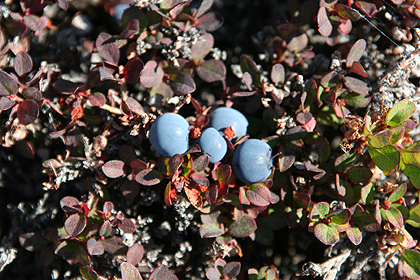 Both blue and black berries can be collected in the Ittoqqortoormiit area in summer /early fall . 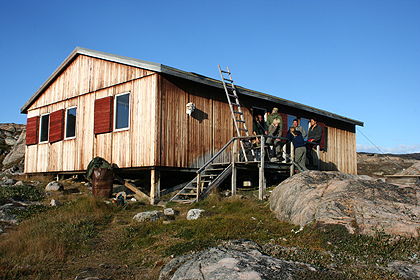 In the Ittoqqortoormiit area theres several cabins free of use scattered around. 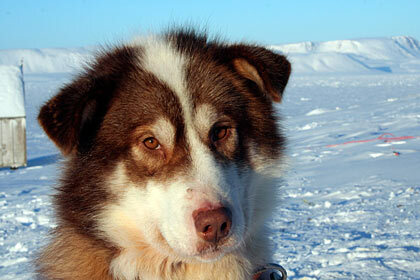 This one is at Kap Hoegh , Liverpoolland. 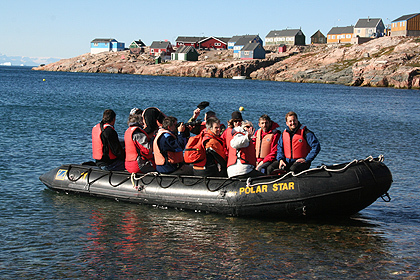 Happy cruisetourists are leaving Ittoqqortoormiit after a good visit. 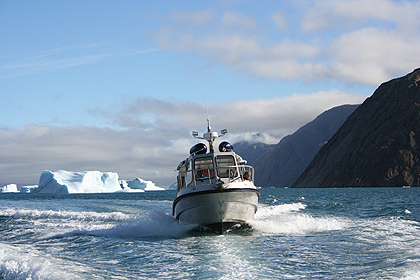 Our passenger approved vessel , M/S Nanu on an expedition in the worlds biggest fjordsystem , Scoresby Sund. 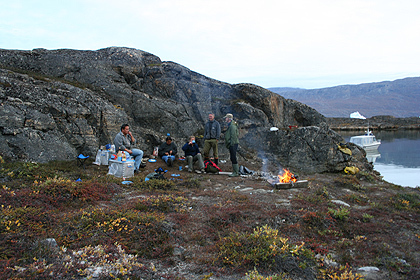 Musk ox barbecue in Hekla Havn , Scoresby Sund fjordsystem . 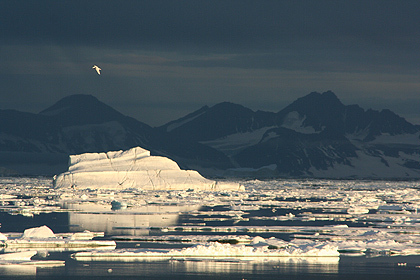 It was here Ryder overwintered with his ship " Hekla" , when exploring and mapping the fjordsystem. 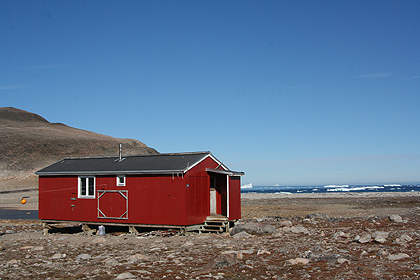 The cabin in Hekla Havn at Denmark Island in the Scoresby Sund fjordsystem. 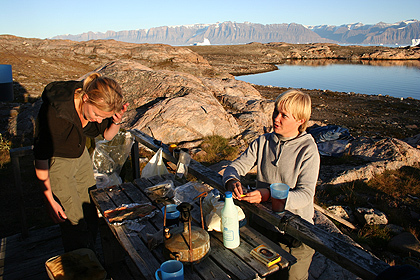 Preparing arctic char for dinner at the cabin at Danmark Oe / Hekla Havn in the Scoresby Sund fjordsystem. 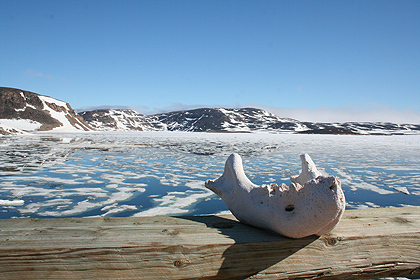 View from Ittoqqortoormiit towards Amdrup Harbour. July.